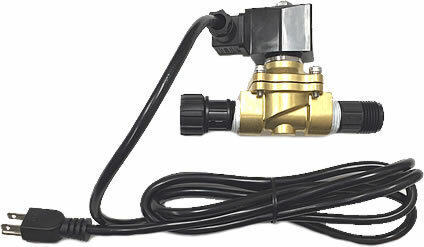 This unique brass solenoid valve can handle low volume applications like gravity feed and misting systems. All fittings are included to connect the valve to 3/4" threaded PVC or standard 3/4" water faucets/hoses. The solenoid valve also comes wired with an 8' power cord. Plug valve into a humidistat to regulate humidity, plug-in thermostat to regulate temperature, or timer for a variety of watering and misting functions. Requires 110/120 volt outlet. Use with a fine water filter. This unique device allows you to water 2 different zones with a single timer. After each on/off cycle, the Hydrozoner switches from one outlet to the other. The red arrow in the center shows which outlet water will flow through for the next watering cycle. This device is compatible with any water timer that has multiple start/stop cycles and does not require any electricity. All connections are for a standard 3/4" water hose or faucet. This filter reduces mist nozzle clogging by preventing trash from entering your water line and minimizing calcium and mineral buildup. Simply screw on to standard garden hose or faucet. Recommended for use with all misting systems. Mist Nozzle Cleaner 8 oz. Because of the extremely small size of openings, some misting nozzles may eventually clog up. If this should occur, the nozzle should be removed and soaked in the Mist Nozzle Cleaner solution (See the bottle label for specific cleaning instructions). If the nozzle is not completely plugged, but simply sprays improperly, the entire mist line can be flushed with the nozzle cleaner for a preventative nozzle cleaning. The nozzle cleaner is nontoxic and completely biodegradable. See the cleaner label for technical information. Recommended for use with all misting systems. Screened Venting & Cooling all in one! Evaporative air coolers, also called pad or swamp coolers, have proven to be the most effective cooling system for a greenhouse short of an air conditioner. It pumps water over the special cooling pads which lowers the temperature of air passing through them. A powerful blower pulls air through these pads and pushes the cooled air into the greenhouse. Hot air can be exhausted through roof vents or exhaust shutters and automated with one of our plug-in thermostats. The cooling pads also act as a filter and help keep out unwanted insects, dust, and pollen. Coolers have a 2 speed fan which can be used for ventilation with or without wetting the pads. Coolers come with water hose connection kit for constant water supply. Requires a standard 110/120 volt outlet. 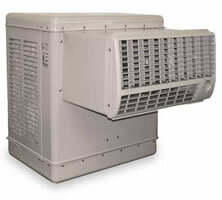 Evaporative air coolers are shipped direct to you in 2 to 6 days! If you aren't sure what size cooler you need, use our Cooler CFM Calculator.